2. Avoid the temptation to jump to the quick fix when solving a problem. In many cases, speed and simplicity can serve you well, but if overused, can limit your strategic alternatives. - Curiosity: You’re genuinely interested in what’s going on in your unit, company, industry, and wider business environment. - Flexibility: You’re able to adapt approaches and shift ideas when new information suggests the need to do so. - Future focus: You constantly consider how the conditions in which your group and company operate may change in the coming months and years. And you keep an eye out for opportunities that may prove valuable in the future—as well as threats that may be looming. - Positive outlook: You view challenges as opportunities, and you believe that success is possible. - Openness: You welcome new ideas from supervisors, peers, employees, and outside stakeholders such as customers, suppliers, and business partners. You also take criticism well by not reacting in a defensive manner. - Breadth: You continually work to broaden your knowledge and experience, so you can see connections and patterns across seemingly unrelated fields of knowledge. 4. Start using strategic language. If you want to be seen as strategic, you have to learn how to talk strategically. Read the latest books, magazines, or blogs on strategy and learn the jargon of strategy and big picture thinking. 5. Broaden your perspective. Being strategic requires that you know a little about a lot of things, not just having deep expertise in your narrow specialty. Learn not only about all aspects of your business and industry, but stay abreast of the world around you. 6. Be willing to take risks and fail. Strategy is one of the most uncertain things leaders do. It involves speculation, ambiguity, and creatively. Strategies will always be second-guessed, and can often be wrong. Develop a thick skin, or otherwise accept a role as a tactical leader. 7. Learn to think more creatively. See “10 Tips for Creative Thinking”. 8. Volunteer to serve on a strategic planning committee of a community organization or non profit board. 9. Understand your company’s and department’s strategy. Do whatever it takes to understand the corporate strategy and how it affects your department’s strategy. Talk with your boss and peer managers, examine annual reports and other company publications, and listen to your CEO’s speeches. 10. Learn to appreciate and respect strategy and those that are good at it. Some people just aren't comfortable with the future, big picture, creative thinking, and possibility thinking. They see it as B.S. and a waste of time. While it’s true many strategies don’t work out as planned, the ones that do often lead to breakthrough results. Very nice post. Great insight. Boy do I love #1 and #6. Thanks! #4 Use strategic language - I am not a big fan. Makes me think about the IBM commercial with "buzzword bingo" where the audience is listening to the CEO babble on with terms like 'value proposition' and they are filling in their bingo cards every time he uses a buzzword! Stop TALKING and start DOING!!! Yeah, I was wondering if anyone would call me on that, especially since I followed that post with a one called “Fight the Leadership Bulls—t”. So it’s a paradox – leaders are often labeled as “too tactical”, or “operational”, often because they don’t have a strategic vocabulary. On the other hand, if you overdo it, without any substance, it comes across as bulls—t. Very good post. 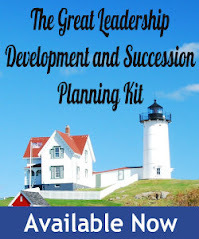 This contains lot of valuable points to nurture future leaders.